Founded in 2011, Fluid Audio is a new enough loudspeaker company that you may not be familiar with them yet. However, engineer/founder Kevin Zuccaro is no stranger to this product area. After a career that began with JBL and Cerwin-Vega, he eventually focused all of his energy on studio monitors, moving to M-Audio and then eventually managing all studio monitor products for Avid. Now, Kevin has taken his decades of experience and applied them to monitor speakers of his own design, and if the FPX7 speakers are any indication, he’s off to an excellent start! The Fluid Audio FPX7 powered monitor speakers find themselves in a very crowded market: the nearfield speaker market in the $500-$1,000 range. What’s impressive is not just these speakers’ sound quality (competitive), but the combination of ribbon tweeter design and co-axial speaker arrangement in a sub-$600 package. These are certainly speakers worth considering for the small project studio, but larger mix rooms will need to pair them with a subwoofer for a truly immersive monitoring experience. As we alluded to in the review opening, the Fluid Audio FPX7 (Fader Pro Coax) monitors feature both a co-axial driver design as well as an AMT ribbon tweeter. The co-axial design has become increasingly popular these days because having all sounds originate from the same position theoretically results in better phase alignment between speakers and more accurate sound quality when listening outside of the sweet spot. Ribbon tweeters are finding their way into more affordable monitor speakers, and they have proven popular because they tend to deliver a wide sweet spot with great sonic characteristics (like capturing fast transient attacks in the signal). The 1”x1.7” air motion transformer (ribbon tweeter) is comparable in size to other ribbon tweeters employed in nearfield monitor speaker design, but measurements aren’t particularly telling when compared to familiar coned tweeters and woofers. The “7” in the product name indicates the inclusion of a seven-inch, low frequency driver. However, we found this marketing claim particularly misleading, as the woofers on these diminutive speakers only measure five and a half inches across the face of the housing. Even with a typical ½” margin behind the baffle, that would result in a 6.5” speaker. Frequency response is specified at 42Hz—27kHz (+/-3dB), and power comes from a pair of Class AB amplifiers: 90w for the low frequency driver and 50w for the AMT tweeter. 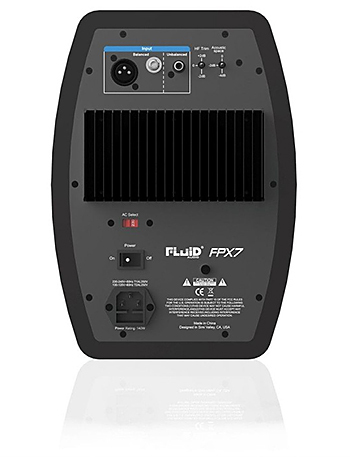 The face of the FPX7 has a logo that illuminates when the speaker is powered, and a Volume control that lets you attenuate the output level. After twenty minutes of inactivity, the speakers enter a low-power standby mode, and the logo’s intensity diminishes. Turning our attention to the rear of the speaker, there are dedicated ¼” and XLR balanced inputs, plus an unbalanced, female RCA-style connector. Two dip switches provide a few tweaks to the overall sound: the HF Trim switch provides a 2dB boost or cut to the high frequency driver, and the Acoustic Space control provides a -2 or -4dB low-frequency shelf below 200kHz. A power switch is located just above the power connection. 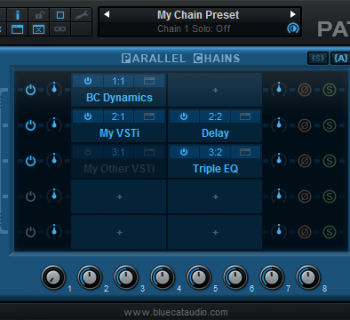 Getting up and running with the Fluid Audio FPX7 was a breeze. We just connected our ¼” balanced cables to the rear, plugged in the power, placed the monitors in our mix environment, and off we went. We loved the fact that the volume attenuation on the face of the monitor speakers has detents/notches for the volume levels, so that we could precisely match our left and right settings, but at the same time wonder as to the actual need for these controls to be front-facing. Generally speaking, set your monitor speaker levels once and then make all subsequent adjustments from your other studio controls. The Fluid Audio FPX7 monitor speakers are good sounding speakers for the small project studio, with a sweet spot large enough to prove enjoyable in their intended listening space. We listened to the FPX7 monitors in a few studio locations, on speaker stands and on IsoAcoustics speaker stands on our mix desk. In all locations, we found optimal sonic results with the rear switches in their default positions, not reducing the high end and not reducing the low end. The ribbon tweeter makes a nice difference in speaker design. The high end was remarkably clear and particularly smooth and even sounding. There was never any harshness to the top end, and we found that acoustic guitars, otherwise lost in the mix on comparable speakers, rang through with notable clarity. The extended high-end frequency response was clearly superior to many value-priced monitors found in basic project studios. The overall response of the speakers was very good, and we continue to be impressed by the coaxial speaker designs we’re experiencing from various manufacturers. There was good clarity in the upper mids, too, but we found the monitors fell short in terms of low-end response and clarity, and the upper lows to low mids were a little bit blurred/smeared in dense mixes. The overall presence leaned more towards crisp and clear than deep and full. We attribute this to the smaller bass drivers in this compact speaker set, and we would not be able to use these in a pro mix environment without at least adding a subwoofer. We suspect that pairing these with the Fluid Audio F8S subwoofer would make a significant improvement, as that sub extends all the way down to 30Hz and would free up the woofer to better handle high lows and mids. 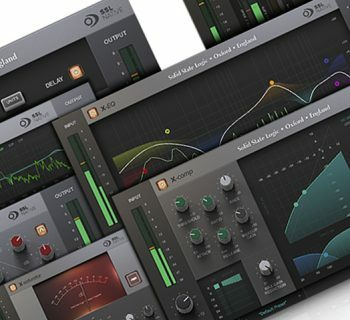 For musicians mixing in smaller rooms, like in an apartment or bedroom setting, you’ll easily achieve quality monitoring results, so in that regard, these monitors do a very good job of providing a clean sounding mix with a beautiful sounding top end at a competitive price. But for the pro-level project studio, if you prefer to mix without a subwoofer, you will be better served by other speakers (at a higher price point). The FPX7 monitors include a brief instruction manual that describes all of the connections, controls, and basic setup principles. 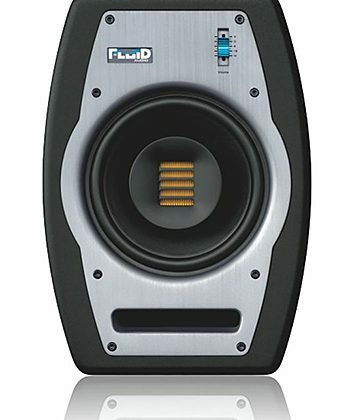 The Fluid Audio FPX7 monitor speakers (MSRP $699.99) sell for approximately $550 apiece. 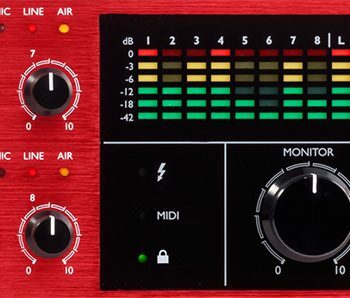 They are competitively priced given their quality and design, and would make a good choice for a small studio or a MIDI production suite in need of keyboard/synth monitoring, but if your budget can be stretched another $100-$200 total, there are better-sounding options available.